"Fiske's efforts to document these victims and the crimes that robbed them of their families and freedom are heroic indeed and should be applauded." – Henry Louis Gates, Jr. This recent book, Solomon Northup: The Complete Story of the Author of Twelve Years a Slave, is a full biography of Solomon Northup. It is not just a rehashed or annotated edition of Northup's autobiography (which is the case for the other available books about Northup). It includes much information about Northup's early life in New York State, what he did after his release from slavery, and his family members. "The best current biography (and the indispensible source to me in writing this column) is: Solomon Northup: The Complete Story of the Author of 12 Years a Slave, by David A. Fiske, Clifford W. Brown Jr. and Rachel Seligman." Northup's experience of being kidnapped and sold into slavery was by no means an isolated incident. Carol Wilson's book from the 1990s, Freedom at Risk: The Kidnapping of Free Blacks in America, 1780-1865, addresses the matter. Kidnappings of free blacks added to the friction between the free states and the slave states, prior to the outbreak of the Civil War. 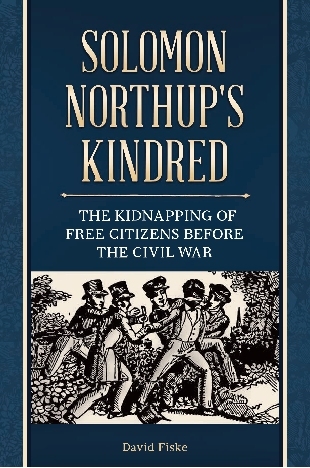 My recent book, Solomon Northup's Kindred: The Kidnapping of Free Citizens before the Civil War, explains the factors behind such crimes, and tells the stories of several dozen victims. Amazon Barnes & Noble, as well as other online retailers. Read this item on the blog of the International Slavery Museum about William Houston, a British subject--one of the kidnapping victims documented in the book. Solomon Northup was a free black living in upstate New York. He grew up in Washington County, and while living there he farmed, worked doing repairs on the Champlain Canal, got contracts to carry materials on the canal, and sometimes played the fiddle at country dances. Because Northup wrote that he was familiar with the villages along the Erie Canal, it seems likely that he also worked on canal boats in the central and western regions of New York State. In the 1830s, Northup and his wife moved to Saratoga Springs. While there, Northup worked for some of the hotels in that resort community, and also helped build a railroad that served Saratoga. In 1841, Northup was lured to the south and sold as a slave. After nearly 12 years, he was rescued, and returned to his family. His book, Twelve Years a Slave, described his experiences. 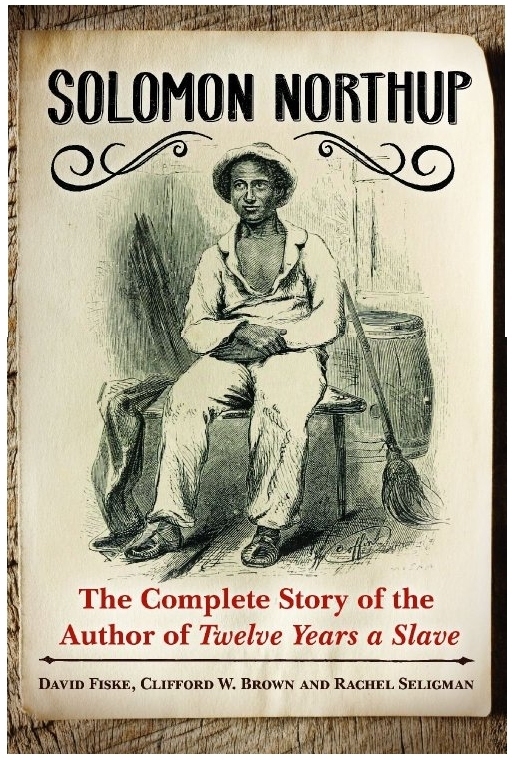 A 2007 edition titled Solomon Northup's Twelve Years a Slave and Plantation Life in the Antebellum South, prepared by the late Sue Eakin (whom I assisted slightly and who credited me in some of the footnotes). The hardcover edition is no longer in print, but it is available as an audiobook, e-book and paperback. See: Twelve Years a Slave, by Dr. Sue Eakin and Louis Gossett, Jr.
Google Books, where you can even save a copy on your own computer by clicking on the Gear icon, then use Download PDF. In 2012, a screen adaptation of Northup's story was filmed in Louisiana, directed by well-known British filmmaker Steve McQueen. Chiwetel Ejiofor plays the role of Solomon Northup, and the cast includes many notable performers, including: Lupita Nyong'o, Quvenzhane Wallis, Brad Pitt, Michael Fassbender, Benedict Cumberbatch, Paul Giamatti, Paul Dano, Scoot McNairy, Sarah Paulson, Dwight Henry, Garret Dillahunt, Michael Kenneth Williams, Alfre Woodard, and Chris Berry (who also appeared in Django Unchained). The movie was released in October 2013, and won three Oscars in 2014, including Best Picture. Watch this featurette about the making of the film 12 Years A Slave from Fox Searchlight. Video: Legacy of Solomon Northup, which includes me. Preview of an extra feature from the Blu-ray disc of 12 Years A Slave, which includes me. Watch a video of me talking about Northup on C-SPAN's Book TV. 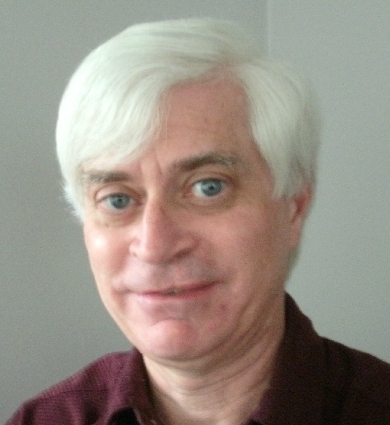 My name is David Fiske, and I have done a lot of research on Northup's life after he regained his freedom. (Cathy Dede, with the Glens Falls Chronicle, has called me the "chronicler of all things Solomon Northup.") After the publication of his book, he spoke rather extensively at various places throughout the Northeast (see a list of his appearances). There is strong evidence that he was involved with the Underground Railroad in Vermont, helping other blacks to become free [View two letters that mention his involvement (click on Digital Content)]. Sadly, it appears that he had financial problems as time went on, and concrete information about his later life (other than his involvement with the underground railroad) is lacking. The circumstances of his death are unknown (though various scenarios have been suggested, but they are not supported by firm evidence). In this article, however, I piece together what little information is available, and ponder whether Northup somehow was involved in the Civil War. My 2012 book Solomon Northup: His Life Before and After Slavery (2012) contains information about what Northup's life was like before he was kidnapped, and after his return to New York. In 2013, a book (described at the top of this page) was published, which I co-authored with Clifford Brown and Rachel Seligman, and that book incorporates the information (and more) from my earlier work. Northup's family relocated to Glens Falls, New York, during the time that he was enslaved in Louisiana. I wrote this item for the Glens Falls Chronicle about the struggles and successes experienced by the family in the Glens Falls region. I want to express my appreciation to Henry Louis Gates, Jr., and Kevin Burke, the editors of the Norton Critical Editions version of Twelve Years a Slave (W. W. Norton, 2016), who identify me as "Northup's current and most devoted biographer." People are curious whether there is a statue of Solomon Northup somewhere. So far as I know, there is no statue of Solomon Northup. There are, however, various plaques, signs, and a memorial stone which preserve aspects of his story. In a small, nearly hidden cemetery in Hudson Falls, New York (which was called Sandy Hill when Northup lived in the area) is the gravestone of Northup's father, Mintus, along with a memorial to his famous son. Mintus' gravestone had broken in two, but in 2014 a new stone was installed to mark his burial spot. (So far as is known, Solomon himself is not buried there.) News story and photos. In Saratoga Springs, New York (where Northup was kidnapped), there is a historical marker that summarizes his story. It is near the spot where Northup first encountered the men who tricked him into leaving home. The precise location--based on Northup's testimony when court officers interviewed him after the two men who'd lured him away were taken into custody in 1854--was probably a bit further up Broadway, about where the Banana Republic store currently stands. View the marker. In 2017, in Washington, D.C., signage was installed identifying the location of Williams Slave Pen, where Northup was held for several weeks prior to his being taken to Louisiana. Story about the signage. In an item titled "Reader Asks: Where's the Solomon Northup Statue in New Orleans," Mike Scott, of The Times-Picayune, wrote about the absence of any statue of Northup. Read the article. As noted in Scott's article, there is a historical marker in New Orleans, at the site of the slave pen where Northup was held and then sold, and it mentions Northup and his book. The marker is located at the intersection of Esplanade Avenue and Chartres Street. Page for the marker. Northup was sold at New Orleans, and was taken to central Louisiana, where his nearly twelve years as a slave were spent. The Solomon Northup Trail in central Louisiana has markers that note the sites of various places from Northup's period of enslavement there. The page describing the trail offers a printable guide for following the trail. In January 2018, in commemoration of the anniversary of Northup's release from slavery, a historic marker was installed in Marksville in Avoyelles Parish, Louisiana. View a photo and read an article about this marker: 'Keep the Flame Burning': Dedicated People Keep Solomon Northup's Story Alive. The rest area on I-87 in New York State (northbound side, north of Exit 18) was renovated in 2018, and now has an Adirondacks Walk of Fame. This is the marker for Solomon Northup. Print/save a flyer that describes presentations I'm able to give. See the topics I can present on. Other ways to contact David Fiske. History talk on February 18, 2012 at the New York State Library in Albany, New York: What Happened to Solomon Northup? I made a presentation for Black History Month, at the Schenecteady County Public Library on February 16, 2013. On May 23, 2013, I gave a slideshow presentation at the Saratoga Springs History Museum titled "Solomon Northup: The Years after Twelve Years a Slave"
September 21, 2013: Talk and Book Signing at the RiverRun Bookstore in Portsmouth, New Hampshire Details on the event. On October 24, 2013, David Fiske, Clifford W. Brown and Rachel Seligman, authors of Solomon Northup: The Complete Story of the Author of Twelve Years a Slave, appeared at The Book House of Stuyvesant Plaza, Albany, NY, to sign copies of the book and talk about Solomon Northup. On October 25, 2013, I appeared on CBS6 Albany to discuss Solomon Northup and the film 12 Years a Slave. Watch it here. Glens Falls Chronicle Autumn Leaves Book Fair, November 3, 2013, I was among those who gave presentations about Solomon Northup. February 1, 2014: Schenectady County Public Library, presentation, "Kidnapped: Black New Yorkers Caught in the Slave Trade." On February 22, 2014, I gave a presentation at the Guilderland Public Library, "Rescued from Slavery: The Story of Solomon Northup." On March 15, 2014, I spoke following a screening of the film "12 Years A Slave," at the Ballston Spa Public Library. On March 25, 2014, at Crandall Public Library in Glens Falls, New York, I talked about how black citizens of New York State were kidnapped and sold into slavery, and I also told how Northup's wife Anne supported her family during the time that Northup was enslaved. .
On March 29, 2014, I gave a presentation at the Langley-Adams Library, in Groveland, Massachusetts. On May 10, 2014, I told about Anne Northup, Solomon Northup's wife, at the Schenectady County Historical Society, in Schenectady, New York. On May 20, 2014 I talked about Northup for the Town of Greenfield Historical Society, at the Greenfield Community Center, Greenfield, New York. On June 8, 2014, I made a presentation "Rescued from Slavery: The Story of Solomon Northup," at Pember Library, in Granville New York. On July 22, 2014, I presented a program on Solomon Northup at the Hadley Luzerne Public Library, Lake Luzerne, New York. On August 2, 2014, I lectured on Northup at the Civil War Music Heritage Gathering and Encampment, held at Centre Church, Windham NY. 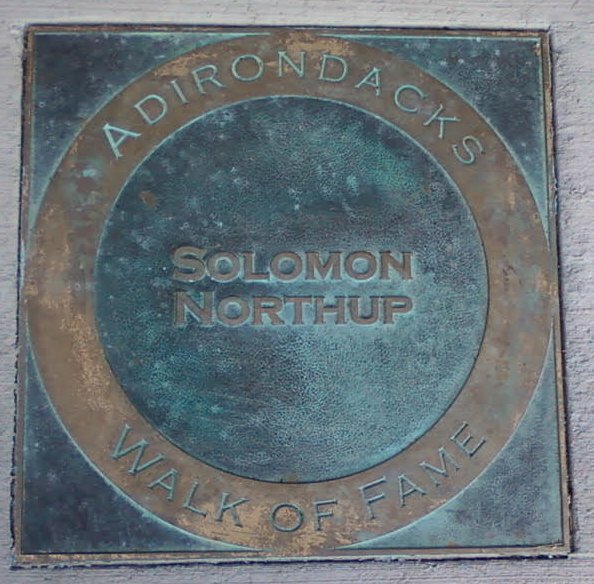 On August 3, 2014, I talked about Northup, and his connection with central New York and abolitionist Gerrit Smith, at the National Abolition Hall of Fame and Museum in Peterboro, New York. On October 4, 2014, I gave a presentation on Northup at the Holyoke Public Library, Holyoke, Massachusetts. On November 2, 2014, at the Glens Falls Chronicle Book Fair, I gave a talk on my efforts through the years to learn about Northup, particularly the elusive details of his death. On November 15, 2014, I attended the Fort Edward Historical Association Annual Meeting, and spoke about Mintus Northup, Solomon's father. On May 16, 2015, I talked about "The Ballston Spa Trial of Solomon Northup's Kidnappers," at the Saratoga County History Faire (Heritage Hunters). On July 7, 2015, I presented "Rescued from Slavery," at the Lee Library in Western Massachusetts. On July 9, 2015 I did a Young Adult program about Solomon Northup for the Wyandanch Public Library (Long Island, New York). On May 7, 2016, I spoke on "The Kidnapping of Free Citizens before the Civil War," at the New York State Library, in Albany, New York. On April 18, 2017, I talked about "New York Kidnapping Victims," at the Greenfield (New York) Historical Society meeting. On July 17, 2018 I talked about "Black New Yorkers Caught in the Slave Trade" at the Warrensburgh Museum of Local History, Warrensburg, New York. My article "Rescued by the Law," about Northup, appeared in the Fall 2012 issue of New York Archives magazine. I wrote a guest column for Adirondack Almanack, about Northup's connection with New York's Adirondacks region. York History Blog, and was nominated for a 2013 Adirondack Center for Writing Literary Award, for Feature Article. I put together an article on Canadian native Samuel Bass. I wrote some material that was included in the production notes for the film 12 Years a Slave. Read my article Authenticity and Authorship: Solomon Northup’s Twelve Years a Slave on the New York History Blog. 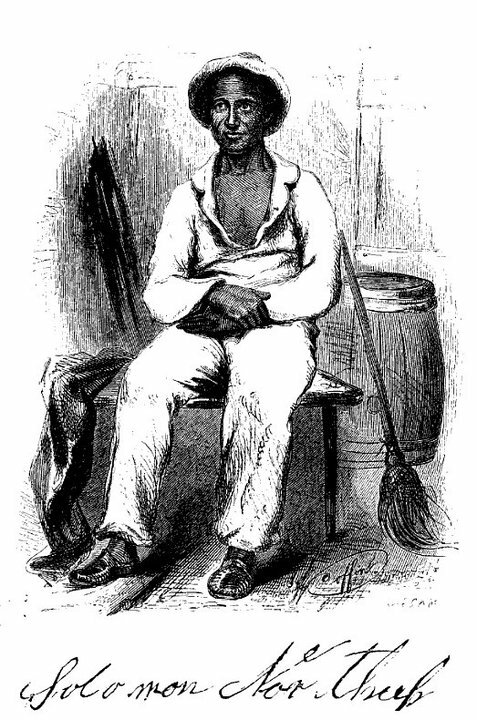 As a musician in antebellum New York State, Solomon Northup was not unique. Read this article I wrote profiling several black musicians in 19th Century New York. I followed up my research on Northup with another project. Northup was by no means the only person who was kidnapped and sold into slavery. I've written a book about some of these other victims, titled Solomon Northup's Kindred: The Kidnapping of Free Citizens before the Civil War. View a slideshow about Northup at slideshare.net. To contact me, e-mail me at info.request@solomonnorthup.com. Need to hire a researcher? Consider David Fiske | fiskeresearch.com.